The Virgo Clear is a whole house, chemical-free Water Filtration System. Its single phase, maintenance-free system delivers clean smelling and pleasant tasting water for the whole family. Bypass valve to divert water around VIRGO for filling pools, hot tubs, etc. 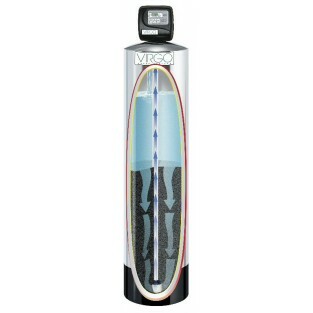 The Virgo Water Filtration System VIRGOCL-100 has one inch connections and has a single phase system. VIRGO Water System's point of entry residential water filters and conditioners (up to 13" diameter mineral tank) are warranted to the original owner at the original residential installation location to be free from defects in materials and workmanship from the date of manufacture as specified. 1.) VIRGO will provide one replacement mineral tank for any tank that fails due to a manufacturing defect. 2.) VIRGO warrants that components for the equipment will be available for the lifetime of the system. 3.) VIRGO will provide comparable components of our selection to replace any obsolete items. 4.) VIRGO will, within five years of manufacture, repair or provide replacement warranted defective control valve parts at no charge. 5.) Water conditioning media are highly reliant on influent water conditions and are excluded from any warranty. 6.) This warranty gives you specific legal rights that may vary from state to state. 1.) The system must be installed and maintained according to local codes and secondarily in accordance with manufacturer recommendations. Contact VIRGO if there are any conflicts between local codes and our printed instructions. 2.) The system must be maintained with VIRGO approved replacement components. 3.) Failures resulting from fire, freezing, neglect, accident, alteration, abuse, improper installation or acts of nature are not covered. 4.) Water pressure must be regulated and not exceed 120 PSI. 5.) Water temperature must not exceed 110 degrees Fahrenheit. 6.) Influent chlorine must not exceed 1 mg/L. All returns must be accompanied by a "Return Authorization" (RMA) number. Ship the defective warranted part(s) to VIRGO freight and insurance prepaid along with a copy of this warranty, original purchase receipt and the RMA number. We will, at our option, repair or provide replacement warranted parts at no cost, excepting freight and on site labor charges. You can contact us at 888-716-9752 or email us at info@virgowatersystems.com. This warranty is exclusive and in lieu of any other warranty expressed or implied, including but not limited to, any implied warranty of merchantability or fitness for a particular purpose. VIRGO shall not be liable for any loss or incidental or consequential damages resulting from the use or inability to use this equipment by the buyer or any user.